5 Orange Line Stations to Close for SafeTrack Starting Tues.
Orange Line riders in Maryland and Northeast D.C. need to make some big adjustments to their commutes during Metro's newest SafeTrack surge, which began Tuesday. Five Orange Line stations are now closed for the next month: New Carrollton, Landover and Cheverly in Maryland, and Deanwood and Minnesota Avenue in D.C. They will remain closed through June 15. Buses are replacing Orange Line trains between New Carrollton and Stadium-Armory. Limited free shuttle buses are running every 30 minutes between New Carrollton and Stadium-Armory. Orange Line trains are running near-normal service every 6-8 minutes weekdays between Vienna and Largo Town Center. 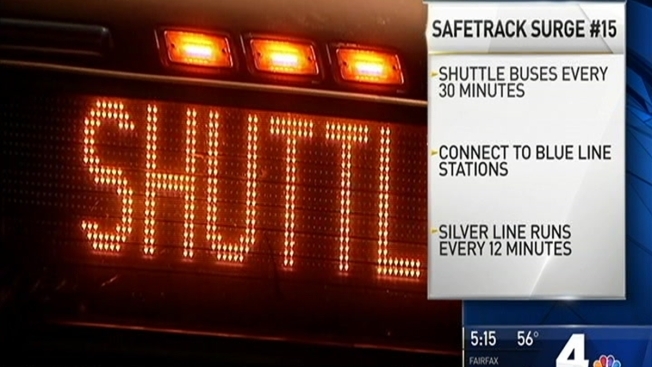 Silver Line trains are running every 12 minutes weekdays between Wiehle-Reston East and Stadium-Armory on weekdays. Midday and evening trains will run every 12 minutes during the week. After 10 p.m., trains will run every 20 minutes on weeknights. Weekend train service may vary during the SafeTrack surge; see weekend train statuses online here. TheBus: Prince George's County bus service operates from 5:30 a.m. to 8 p.m. daily. See all routes here. Metrobus: WMATA has a full list of Metrobus routes serving affected stations on its site here. MARC's commuter rail trains may be an option for some riders. MARC's Penn Line is adding more rail cars to trains during this SafeTrack surge, but MARC warned riders that trains are likely to be very crowded and passengers may have to stand. Boarding will be halted on trains when they reach capacity. The Penn Line stations likely to be most affected by this SafeTrack surge are Bowie State, Seabrook and New Carrollton, MARC said on its website. See MARC's Penn Line timetable here. The Camden Line may be an option for some riders, MARC said; see the Camden Line timetable here. More information on fares and parking at MARC stations is available here. Consider biking as another travel alternative. See bike maps for Prince George's County, Northeast D.C. and other spots around the area online here. Don't have your own bike? Find a map of Capital Bikeshare stations here. Bikeshare has added an option for users to buy a single trip for $2. See Maryland's Commuter Connections page online here.